The Merrick Family. From Left To Right: Isiah, Kate, Britt, Daisy. It’s hard to imagine that this little girl would become a warrior for the Lord through a period of difficulty and pain that no one would want to place on anyone. Daisy faced a life changing experience that started when she fell on the playground during her first month of kindergarten. There was nothing usual about her fall, but her reaction was unusual. Rather then getting back to playing immediately or crying, Daisy simply sat there and told the school’s staff that she needed to go to the hospital. Daisy did not feel well, but no one knew why she was feeling bad as there were no clear injuries such as a broken bone, concussion, etc. Of course, the school contacted her parents about the accident and updated them on what occurred. When Britt and Kate arrived at the school, they concurred that something was suspicious. As a result, they decided to rush her to a Santa Barbara hospital to make sure Daisy did not have any possible internal injuries. Her parents would only become even more concerned as test after test was taken, and more doctors became involved with their daughters case. In time, Britt and Kate received the news that Daisy did not receive any injury related to her accident. But that she had a Wilms’ tumor that was the size of a Nerf football that took up most of her abdominal cavity. In an instant, everything about Daisy’s joyful filled life radically changed. The news certainly turned their world upside down and into a state of shock, confusion, and even fear. Daisy underwent a lengthy surgery to remove the Wilms tumor. The doctors had to remove the kidney affected by the Wilms tumor due to its size and the complexities of removing it. She underwent chemotherapy and radiation, like so many other cancer patients, after the surgery. As a result of the several months of treatment, she lost all her hair and much of her energy as expected. This forced her to spend her time at the hospital or home. Throughout this time, her family, Reality Carpinteria, and churches across the nation prayed that God would heal Daisy of cancer. The prayers were answered as she won her first battle with cancer. In September 2009, Britt Merrick delivered the news of Daisy’s cancer discovery with Reality Carpinteria and our need to always trust God. 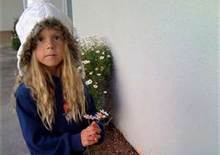 The family provided the following video on their pray for Daisy blog, which showed her joy and excitement after being pronounced cancer-free in May 2010 and her anticipation for the Merrick families visit Hawaii. When Daisy completed her treatment and the first follow-up scan to check for cancer came back good, the Merrick family celebrated. The family decided to take a vacation to Hawaii with the good news where they spent their time swimming with sea turtles, eating shaved ice on the beach, surfing while enjoying a month of health. The families joyous time would come to a halt when Daisy started to complain about a stomach ache that became unbearably painful. The Merrick family rushed to the hospital once again to find out that Daisy’s cancer had returned. Her cancer returned as a grapefruit sized tumor. She had to undergo two difficult and dangerous surgeries to remove the tumor. The relapse of her cancer resulted in Daisy having to undergo a second round of chemotherapy that was stronger than the first. This caused her full head of hair, which looked like peach fuzz, to fall out. The recurring of the Wilms tumor resulted in a smaller chance that she would survive. Everything defiantly took a toll on Daisy, the Merrick family, and all those that knew them. Britt Merrick shared the painful news of discovering Daisy’s second tumor in July 2010 to the Reality Carpinteria congregation. He shared in the hope that those who put their faith and trust in Jesus when dealt with pain and sorrow. One day, when Daisy received her daily shot, she wept while saying, “I hate cancer.” The family and all those that knew the Merrick’s agreed with the sentiment. Through all this, the family knew that friends, family and strangers around the world were praying for Daisy to be healed. Those prayers were answered as Daisy was healed from cancer, once again. The Merrick family, like so many others, have gone through an event that caused them to realize how much their lives are in the hands of God. Daisy would tell Britt and Kate, during her chemotherapy treatments, “People are only one time important, and God is like a thousand million billion googolplex important.” The fragility Daisy’s health keeps them looking to Him for their strength, grace, and hope. The families battle left them feeling blessed each day as Daisy spent a year undertaking many new activities. She began learning how to dance jazz and ballet, took horseback riding lessons, played with her brother, fell asleep with her dog by her side, and enjoyed singing songs. Daisy was back to being her regular self as she lived, laughed and played like any other kid her age. This abruptly ended when a follow-up appointment for a routine scan ended with the news that Daisy’s cancer returned. Britt Merrick announced the unfortunate news on his Facebook page with details of what was next and the families hope. Not sure how to say this guys… My daughter Daisy (7) had a CAT scan today. Her cancer has returned. 3rd time being diagnosed with cancer in as many years. She has a golf ball size tumor right where her last one was. Tomorrow she gets a PET scan to look closer and see if its anywhere else and in prep for surgery next week. Then we’ll see how to proceed. Our current hope is that we rally prayer tonight and when they look tomorrow the tumor is miraculously gone or non-cancerous. The oncologist says for the tumor to not be cancer would be basically a miracle. We believe in miracles… we believe in Jesus. Her third Wilms tumor was removed from her abdomen this past April. The tumor was the size of a golf ball. Small compared to the previous two, but the operation required the doctors to remove her spleen as well. The surgery went well, but Daisy now faces the results of more chemotherapy, procedures, and treatments. Daisy’s parents, Britt and Kate Merrick, are pursuing the use of both traditional and progressive cancer treatments in America and Israel. As a result, Daisy will be undergoing chemotherapy, once again, and a possible stem cell transplant. Unfortunately, their health insurance will not cover roughly $500,000. The family needs to raise that money to provide the best medical care and support available for Daisy. Those who wish to know how they can help have several options. First, those interested and able can give financially to help raise the money necessary. There are several organizations that have launched fundraiser’s to help. Crossfit Pacific Coast started a Day 4 Daisy where athletes will compete in Santa Barbara in efforts to raise funds to go towards her care. And Hope Mob started a campaign that will unite people from across the world to help the family in their need. Last, but not least, the family started The Daisy Merrick Trust that anyone could give for Daisy’s care online or at their local Chase bank branch. Secondly, I am sure that the Merrick family would appreciate prayer. If you wish to pray, please do so for Daisy’s health; strength and encouragement for the Merrick family; and wisdom for Britt and Kate to make the best choices; and that the families vertical and horizontal relationships are strengthened through this time. *Quotes from Daisy “Love” Merrick are taken from her story on the pray for Daisy blog.